Everyone makes one wrong assumption about short hair: that it leaves you with limited styling options. 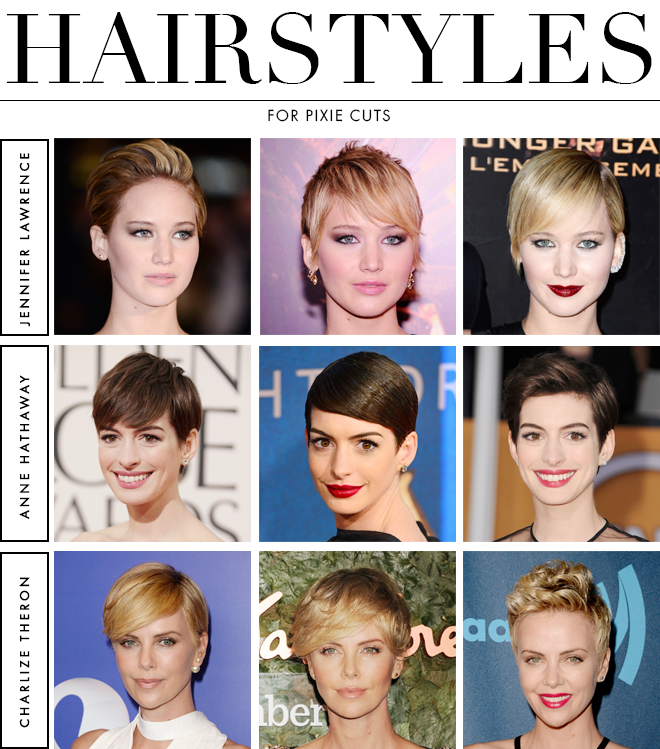 However, as more and more celebrities — such as Jennifer Lawrence, Anne Hathaway and Charlize Theron — opt for the pixie, they’ve proven just how versatile the cut can be. With just a few inches of hair (and a little bit of product), you can transform your short ‘do in minutes. The great thing about short hair is how healthy it looks. Unlike long locks, you’re not plagued by split ends running down a strand of hair. “Shine is key to highlighting the health of the hair and showing off the shape of the cut,” says Herbal Essences Celebrity Stylist Charles Baker Strahan. For a soft shine and smooth finish, apply a quarter-sized amount of oil, such the Josie Maran 100 Percent Pure Argan Oil Light ($48, sephora.com). It’s so light it won’t weight thin hair down. For those with super thin strands, get that shine with your shampoo, such as the Herbal Essences Moroccan My Shine Shampoo ($3.99, us.herbalessences.com) that is formulated with argan oil. For everyday wear, sleek and straight is fast and doesn’t require much styling. And it looks flattering no matter the thickness of the hair. Just compare Jennifer Lawrence (top right) and Charlize Theron (bottom left). Thin or thick, the straight style falls gracefully, putting emphasis on the eyes. To recreate, use a round brush to blow dry hair, pulling the hair straight down. Angle the brush to the side when drying the bangs to keep them off the eyes. For a light tousled look, like Jennifer’s fluffed up style (top left) or Anne Hathaway’s swept bangs (middle right), you need just a tiny amount of product to direct the hair. To pull hair back like Jennifer’s, apply a small amount of pomade to the fingertips and lightly brush the product back into the hair. You want the hair to have that piece-y separation that the fingers provide. For Anne’s side-swept look, pull the product through the fingers to the side. Instead of a piece-y finish, you want to fluff up the bangs, pulling the hair up with the fingers and smoothing it with your palm. Charlize demonstrates (bottom center) that a pixie work with waves. Creating that touchable volume is simple. Think of it as a blowout for short hair. Rough dry hair to get that natural wave, then spray texturizing spray all over. For a bold look, copy Anne’s perfect sleek style. To get strands to sit so perfectly, start with towel dried hair. Create a deep side part, brushing the hair down flat. Then coat your fingertips with a light hair oil or gel, stroking it onto the hair. Let the product air dry for that wet finish.